Pan bagnat or Pan bagna as it is sometimes called is one of the most popular fast foods you can buy in the south of France. Although the term fast food conjures up images of unhealthy fast foods, this is in fact a truly tasty and healthy snack which comes as no surprise as this is France after all! This delicious food is really the equivalent of taking a Salade Niçoise and making it into a quick and easy French fast food. It consists of a crusty French roll, drenched in olive oil and packed with the fresh healthy ingredients you would find in a traditional Salade Niçoise and believe me it is truly wonderful. You will often see the local French people eating them whilst playing a game of French boules or pétanque as it is such a great snack which you can take with you for such activities and it makes a great picnic food too. For this recipe you will need to use it as a guide and vary it according to how many you need it for and which variety of salad vegetables you have available. If you don't like anchovies you can use tuna instead or simply make a vegetaraian version and leave out the fish. However, the original version will of course include the anchovies. You can wrap them in cling film or foil and put in the refrigerator overnight and they will be ready for your picnic. They seem to improve if left this way as the bread becomes soaked with the olive oil, which is what is how they should be. · Slice the tomatoes, radish and onions into thin rounds. · Shell the hard boiled eggs and cut into rounds. · Thinly slice the bell peppers into lengths. 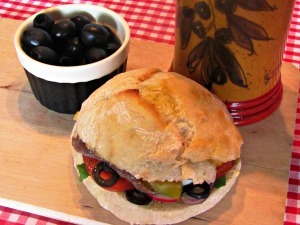 · Pit the olives and slice into rounds. · Dip the anchovies in fresh water to desalt them. · Cut the bread rolls in half and remove the soft white middle from the centre of each half. · Rub the inside with the garlic clove. · Drench the inside with olive oil. · Sprinkle lightly with salt. · Finally, layer the inside of the bread roll with the sliced tomatoes, the pepper, radish, onions, egg, olives and finish with the anchovies. · Drizzle with lemon juice and olive oil.